Head on over to the down loadable audio page, now. Many of you have been asking if we could make my presentations available for download instead of on CD. You can now do both! 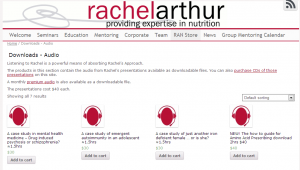 The Rachel Arthur Nutrition (RAN) store on the website now has downloadable audio and CD-audio sections where you can buy my presentations. You can also get the regular case-study premium audio product from its own page. If you have been waiting for presentations in this form, or you just want to have a look around, please go to the downloadable audio page now.